A questionable stew of 70s and 80s pop culture, schlock cinema, comic books, and rock & roll. There’s no getting around the fact that Percy Jackson and the Olympians: The Lightning Thief bears a number of similarities to the Harry Potter series. Both feature a young male protagonist who doesn’t realize he has special powers. Adolsecent Harry learns that he is a wizard and gets sent off to wizard school, while teenage Percy Jackson (Logan Lerman) learns that he is the son of the Olympian god Poseidon and gets sent off to demigod camp. Both disobey the warnings of their instructors to embark on dangerous quests accompanied by two companions; in Percy’s case, a comic-relief Satyr named Grover (Brandon T. Jackson) and Annabeth, the daughter of the goddess Athena (Alexandra Daddario). To top it all off, the director of this first installment in what will no doubt be a series of films is Chris Columbus, who also directed the first Potter film. But hey, some of my favorite movies are rip-offs. Spielberg’s Jaws is a classic, but I’m just as happy to watch Joe Dante’s cheap knock-off Piranha. Star Wars (aka Episode IV: A New Hope) steals most of its plot and characters from Akira Kurosawa’s The Hidden Fortress, but knowing that doesn’t lessen my enjoyment of George Lucas’ space opera. 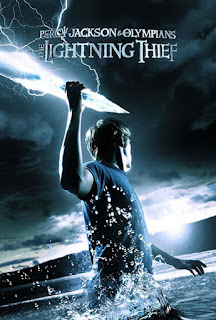 Similarly, I found myself enjoying The Lightning Thief just as much, if not more, than most of the Potter films. Yes, Percy Jackson is clearly following a tried and true formula, but it modifies the ingredients enough that it takes on its own distinctive flavor. One of the key differences between the two franchises is that The Lightning Thief feels considerably less cluttered. My biggest issue with the Harry Potter films is that they all feel stuffed to bursting in an effort to cram as much of the books on screen as possible, without any real regard for how that might flow cinematically. That’s not an issue here. Neither does The Lightning Thief seek to constantly distract us with multiple little special effects gags in the corners of every shot. There’s even a real honest to goodness ending that makes it possible to enjoy the film on its own, even if the sequels never get made. It also helps that The Lightning Thief has a strong supporting cast, including Catherine Keener as Percy’s mother, Joe Pantoliona as Percy’s wicked step-father, Pierece Brosnan as a centaur who teaches the young demigods and goddesses, and Uma Thurman as Medusa. Plus it has some cool monsters, which is always a good thing in my book. By no means is this a great movie, but it was a lot more entertaining than I expected. 3 out of 4 stars. Good to see a positive review for this one! Im rooting for it to be an enjoyable fantasy flick! I will be watching this one soon in theaters, thanks for the review! haha yes, i do love how they refer to cops as the man!and the heat! ....."the Loser can out ride the heat any day." I think that's why I shy away from this film because of its comparison to Harry Potter. I'm sorry. I know I am in the minority here, but I just can't get into those films.